The Super Boat 2015 season is off to a flyer! 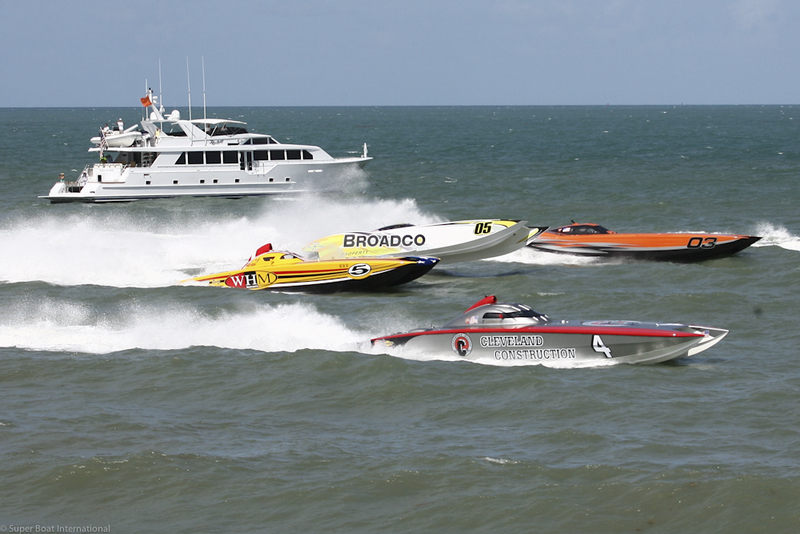 This year’s 6th annual Thunder on Cocoa Beach Super Boat Grand Prix gave spectators a front row seat to fierce competition accompanied by heart-dropping roll overs and brutal waters. As a result of talent and exceptional hard work, the CMS 52’ MTI team came out ahead, earning first place in the Superboat Unlimited Class. 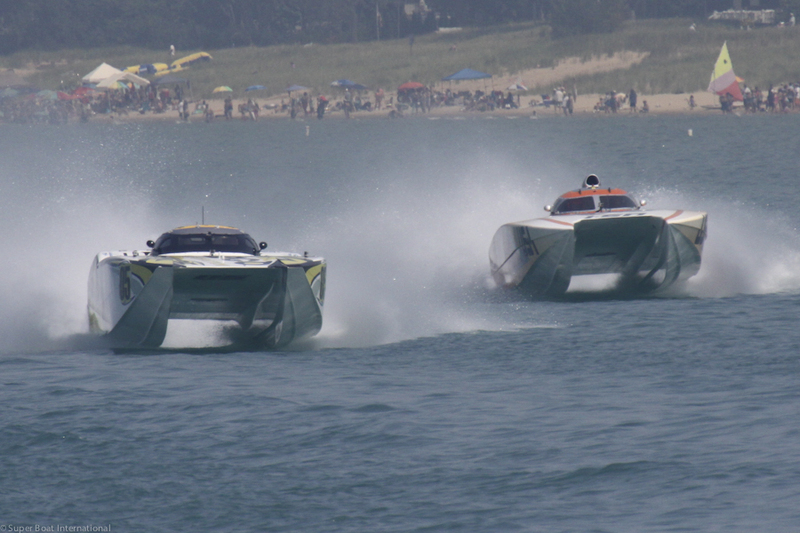 Teams competed on Lake Michigan this past weekend during the 6th Annual Great Lakes Super Boat Grand Prix with a crowd that appeared to exceed last year’s reported attendance of 110,000 people. Team Broadco (Superboat Class) excited the crowd by leading green flag to checkered flag in both heats on a spectacular summer August day. Red Lucas Oil Silverhook won unchallenged in the Superboat Extreme Class. The WSB team take a closer look into the days racing at Key West. 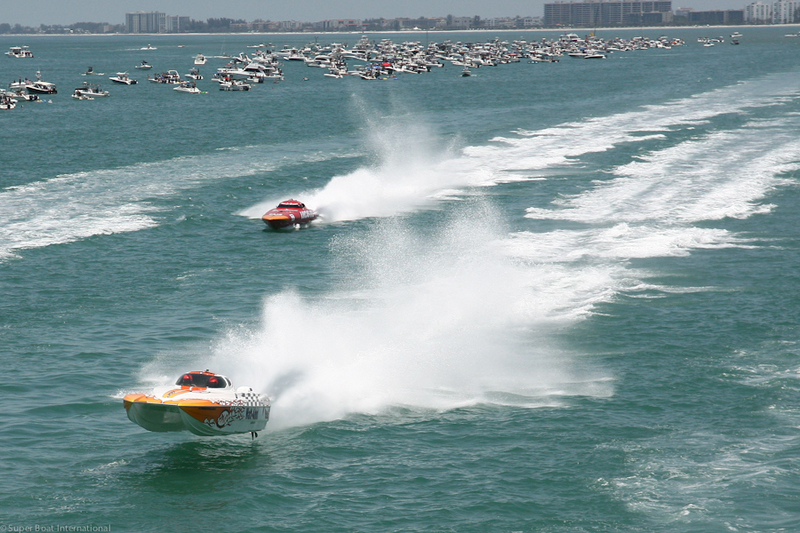 Another sun filled, performance packed, Super Boat International weekend, crowned 7 winners in the fleet of 41 boats for the running of the 30th Annual Suncoast Superboat Grand Prix this past weekend. All the class winners included Two Cruel (P4), Black Pearl (P3), The Hulk (Superstock), Sun Print (Superboat Vee), Team STIHL (Superboat), Team Instigator (Superboat Extreme) and Miss GEICO (Superboat Unlimited). The WSB team were lucky to be ring side to take in the action. 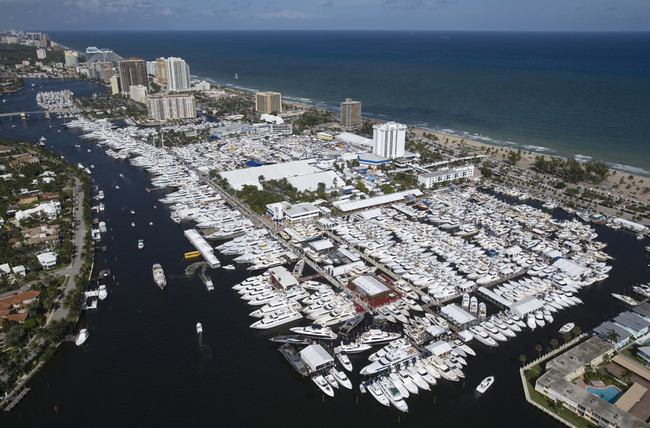 It’s that time of year again for the world’s largest international boat show to raise its gates, Fort Lauderdale, Florida, lives up to its nickname as “Yachting Capital of the World”, hosting the 51st Fort Lauderdale International Boat Show on October 28-November 1, 2010. With more than 3 million square feet of space over five locations, the show’s transportation network of bus shuttles, water taxis, and riverboats ensures attendees can easily navigate the boat show and its expansive waterways system. Here is a sneak preview to some of the new boats and yachts that will be launched at the this year’s show. Sometimes there are things that just break the mould, things that people think are just not possible and things people dream of but are not brave enough to turn into reality. However there is a company that lives on the edge of imagination and makes it reality. Welcome to the world of Wally! Although around for a few years now, the Wally 118 is nothing short of sensational, still able to turn heads amongest super yachts lined up in Monaco. 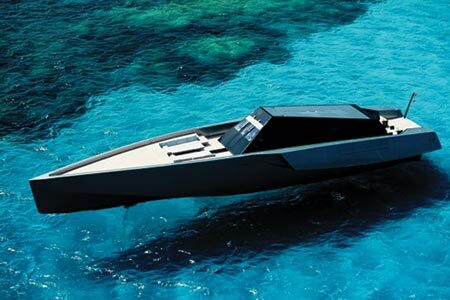 Her design is futuristic and simplistic to the eye but underneath she oozes technological advances that are still not seen on some of today’s newly launched super yachts. 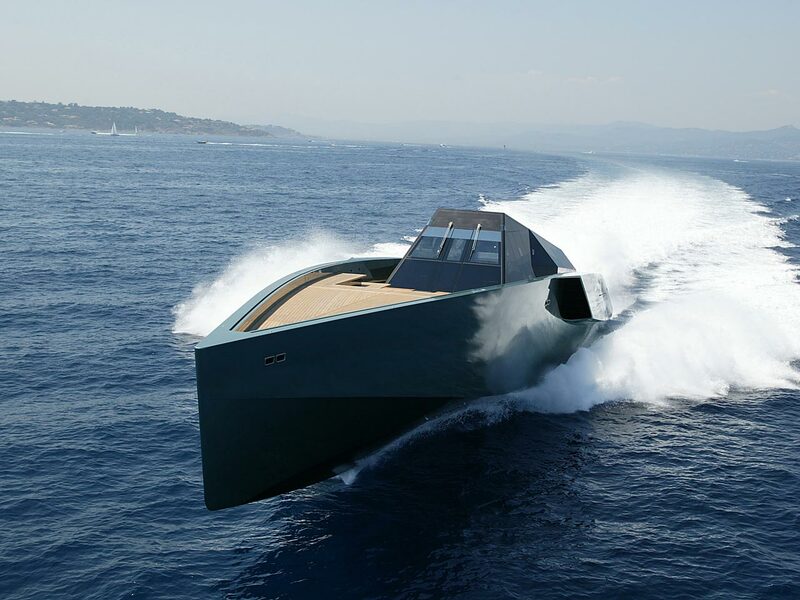 Luca Bassani’s Wally Yachts are not just an exercise in styling, it is in fact driven by some of the most demanding technical challenges ever taken on by a boatbuilder. 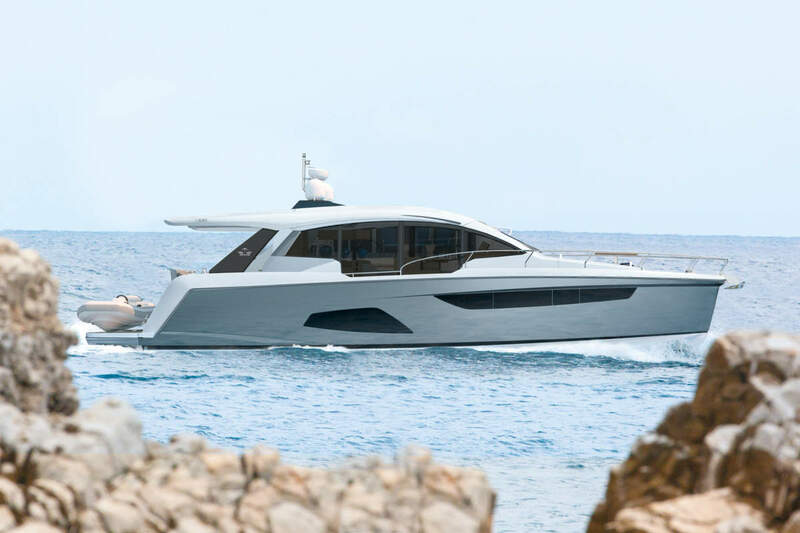 Genuinely new and high-tech, from her engine room to her folding radar mast, the Wallypower 118 has carbon, glass, and honeycomb construction, a superbly minimalist Euro interior by Lazzarini & Pickering, and a nearly 60-knot top speed. 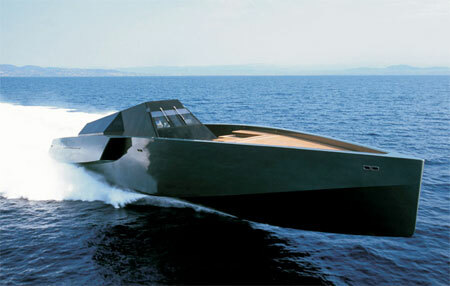 Scale models were tank tested at SSPA in Sweden and in Ferrari’s wind tunnel at Marinello, Italy. Intermarine, the renowned warship builder, built her. As a conscious re-evaluation of what express motoryachts should be like, she’s entitled to look a little out of the ordinary. 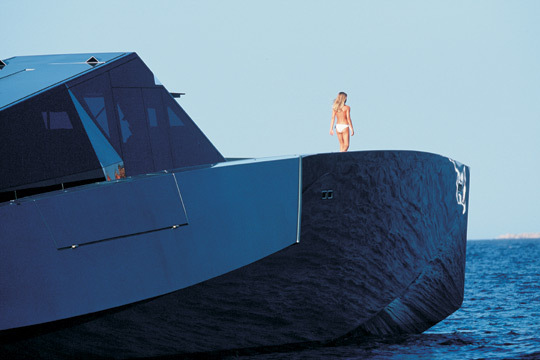 The 118 is an express motoryacht with berths for six guests in three en suite staterooms and six crew, and her accommodations are arranged symmetrically on each side of a straight, central corridor in that unique angular hull. 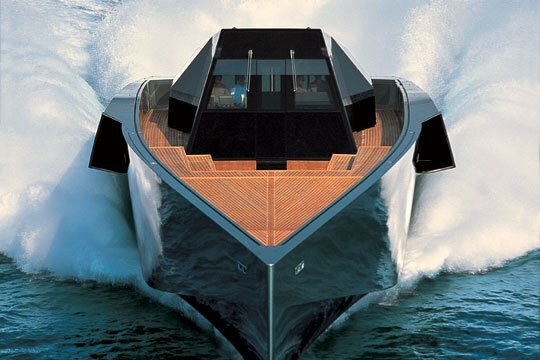 The tender garage—in the bow—is revealed when a triangular section of the foredeck lifts, dead level, on three hydraulic rams. 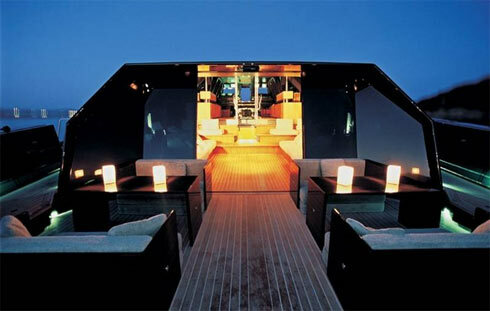 Just forward of the superstructure is an inset seating area, which can be shaded by a bimini top. That mysterious glass-sided deckhouse shelters a capacious saloon aft, with white upholstery, plain wood surfaces, and a seductive, beach-house ambience. 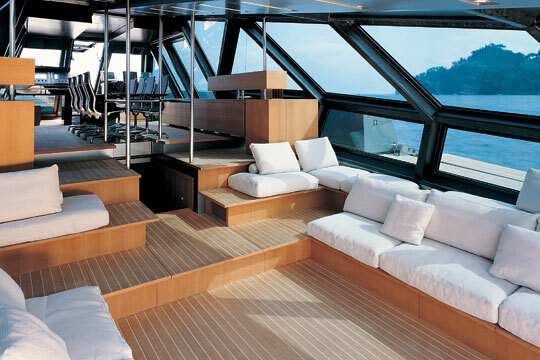 The dining table sits amidships, just aft of the helm, made of carbon fiber. 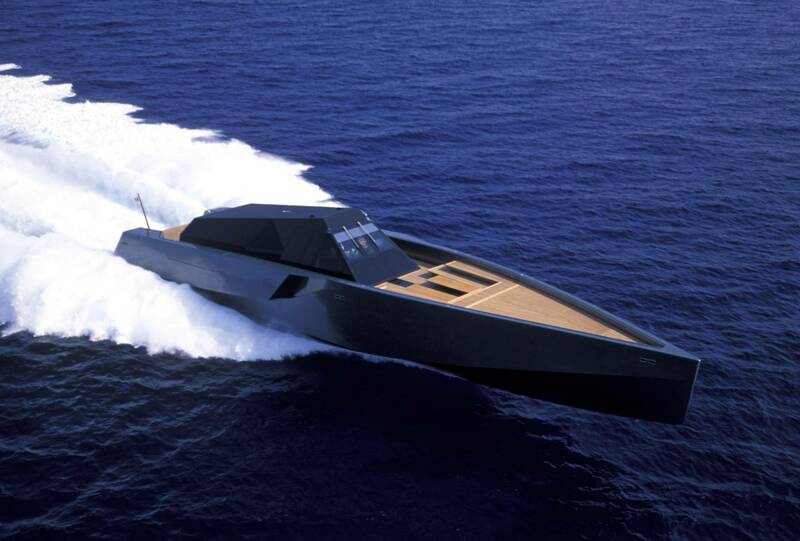 The 118 has a CODOG (combined diesel or gas) propulsion system—jet engines for speed, diesels for everything else—common on small warships, but rare on yachts this give her the ability to hit that magic 60knot mark with ease. While gas turbines offer tremendous power-to-weight benefits (3.6 hp per pound in the TF50s), they do have a downside, as one British Harrier pilot discovered not long ago in 100-plus-degree conditions in the Persian Gulf, when his breathless aircraft landed in the sea beside the carrier. Although the Wallypower is unlikely to suffer such drastic consequences, jet-engine output typically declines by about 0.5 percent for every 1ºF increase in air temperature. The Wallypower uses three DDC TF50s (maritime cousins of the Chinook helicopter engine) driving three KaMeWa waterjets. Their 5,600 hp is calibrated at a lab temperature of 59°F—a little different from an August afternoon in Florida. However hot it gets, though, the 118 should always be able to cruise at 40 knots without effort. Not many 100-footers can make that claim. There is a more conventional engine option as well: twin 3,650-hp MTU 4000 V16 diesels, which Bassani claims will give the boat a 45-knot top speed and around a 40-knot cruise speed. 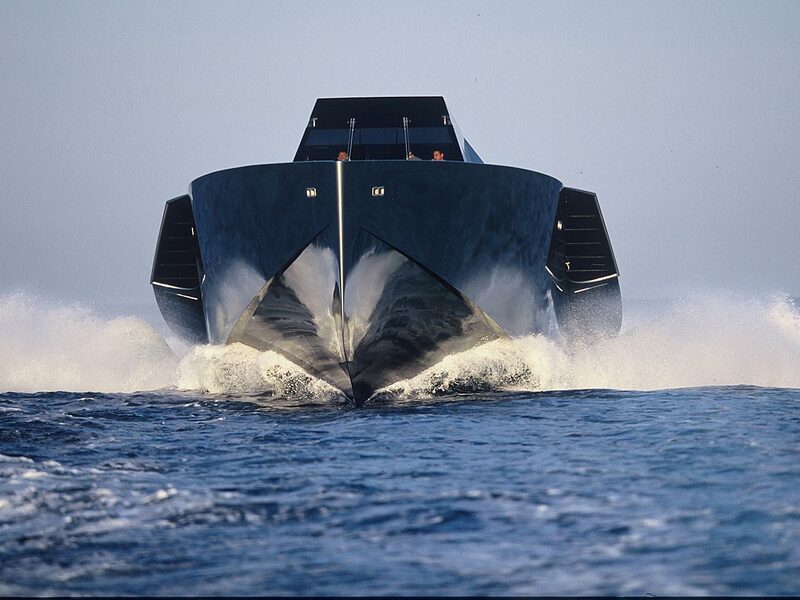 Go for these, and you’ll also save about $8 million on the asking price (which is $16.55 million when the yacht is equipped with twin diesels, $24.83 million as tested above, with triple gas turbines). It seems though that Wally only ever produced one fully operational 118, there is speculation that they produced another 2 hulls in preparation for orders for the yacht, however to date they don’t seem to have happened. If you know of more than one Wally 118 out there please let us know. Looks like Crownline boats could be saved after all. 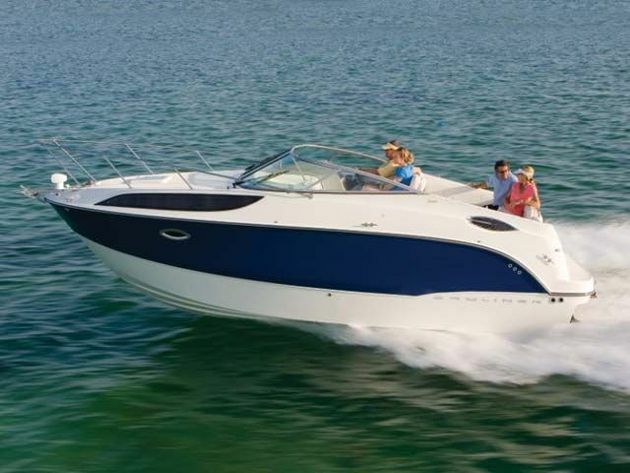 The US manufacturer of sports boats and cruisers has stumbled on bad times in recent months but now looks like it could be saved and given a much needed boost to get the business going again from new owner. 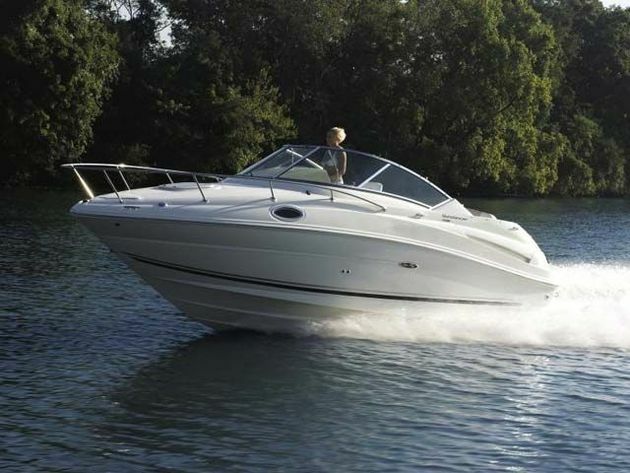 The Searay 230 Sundancer captures the real essence of today’s modern sports boats. 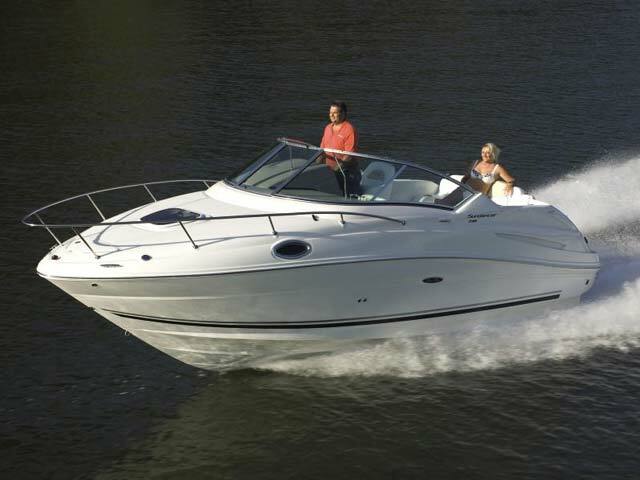 You won’t find another sports boat package that comes as complete and as ready to go as the 230 from Searay. The 230 has all the characteristics you would expect from this leading manufacturer, easy to drive, maintain, and afford. In addition you will benefit from a range of comforts that has made the Searay sports cruiser series so popular world wide. 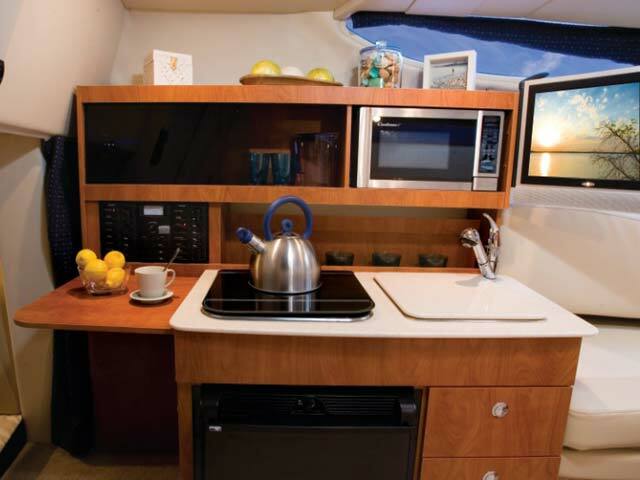 The 230 offers a traditional V-berth and a mid-stateroom offering accommodation for 4 person if required so perfect for a weekender, with 4 onboard for a weekend the 230 also offers a well thought out galley made from Cherry, cognac or maple wood-finish to give a warm harmonious feeling to the light coloured cabin furnishings. 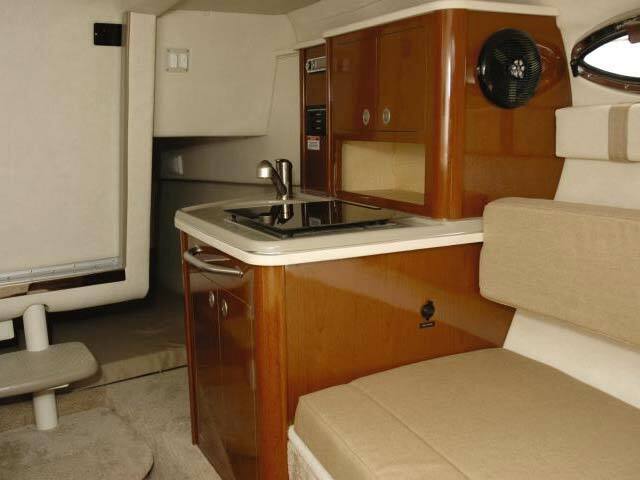 A stainless steel head, full fibreglass shower and curtain, portable mirror vanity w/Sink, Faucet w/Pullout supported with and optional extra called the overnight package that includes air conditioning, shore power, water heater and more. 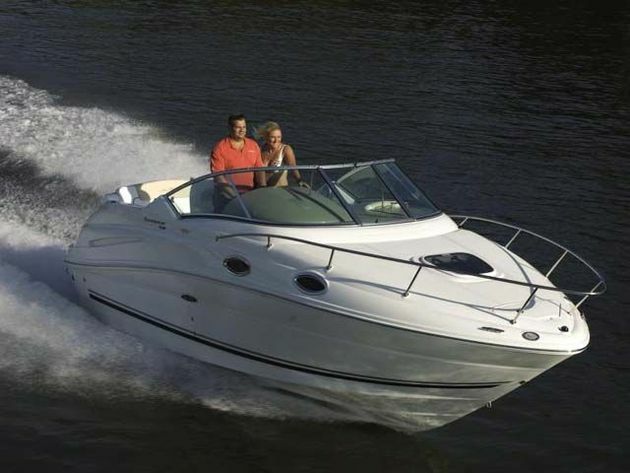 The 230 Sundancer engine options come from Mercruiser or Yanmar, our choice would be the Mercruiser 350 Magnum MPI Bravo III set up producing 300 HP and pushing the 230 on to a very respectable and exhilarating top speed of 40 plus knots. The helm console is highlighted by a black coral dash panel and SmartCraft® instrumentation with built-in engine diagnostics and all the usual array of equipment you’d expect on a craft of this size plus the option of a fitted Navman chart plotter system if required. 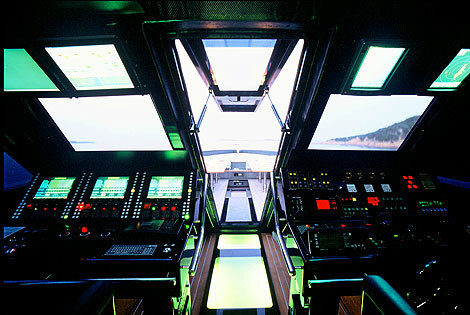 Step away from the helm position and you will find yourself within an entertaining cockpit design with designated conversation area and portside lounger. 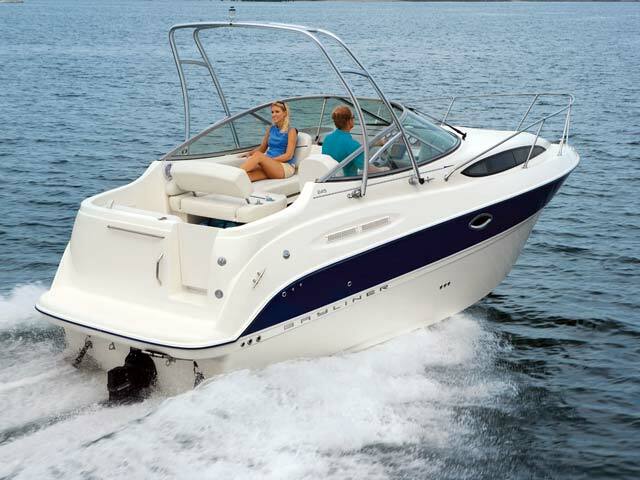 The Sea Ray 230 Sundancer presses all the right buttons for a perfect weekend sports boat and of course is a great boat to have lots of fun with.